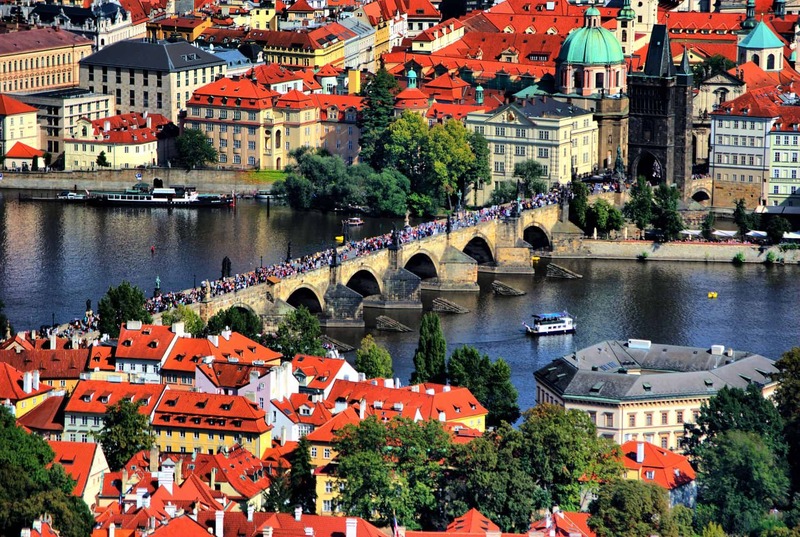 See the cultural sites of Central Europe’s great cities. Over nine days you’ll explore Buda and Pest, the two distinctive halves of Budapest. You’ll also see the imperial splendour of Vienna and the fairytale streets of Prague. These cities are distinguished by great architecture, fascinating – often brutal – history and great food and drink. When you arrive in the Hungarian capital your driver will meet you and transfer you to your hotel in Pest. Budapest is a city with two very distinct sides. Buda in the west and Pest in the East – the two halves of the city were unified in 1873. The Buda side is distinguished by imperial architecture, embodied by the Hapsburg Palace. Over in Pest, you’ll find a more hipster culture with many cafes and Budapest’s distinctive ruin bars. The clue is in the name: they are bars built in ruined buildings. Today you’ll set out on a guided tour of Buda. You’ll see the former Austrian Hapsburg court at Castle Hill. The eastern side of the city has maintained a distinctive Hungarian identity in defiance foreign rule. You’ll visit the Hungarian National Gallery in what was once the royal palace. On the bank of the Danube, you’ll visit the faux-Medieval splendour of Fisherman’s Bastion. After a morning visit to the great market, you’ll explore the city’s Jewish history at the Great Synagogue, the largest in Europe. You’ll also explore the darkest chapter of European history at the Holocaust Memorial and Jewish Museum. At the city’s largest church, the Basilica of St Stephen, you’ll see panoramic views from the dome. Construction began in the mid-19th century, but halfway through the building process, the building collapsed. Undeterred, the builders started again from scratch. The church was finally completed in 1905. This morning you’ll take a first-class train to Vienna. Your guide will meet you and take you on a tour of the imperial city, including the famous Ringstrasse, a UNESCO World Heritage Site with a lot of beautiful architecture, including the Vienna State Opera. At the Hofburg imperial palace, you’ll see the home of the Hapsburgs. This morning you’ll head southwest and visit Schönbrunn Palace, the former summer residence of the Hapsburgs. At the Hall of Mirrors you’ll see the place where Mozart gave one of his first performances, aged 6. 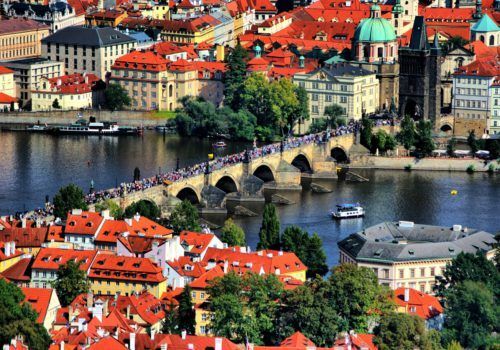 You’ll be taking a half-day train ride to Prague. When you arrive your guide will meet you and transfer you to your hotel. This morning you’ll set out on a guided tour of Prague’s Old Town. 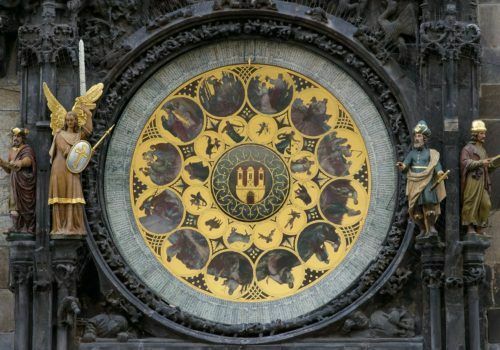 You can also see the hourly performance by the ticking figurines of the astronomical clock. At the Jewish Quarter you’ll see the birthplace of Prague’s most famous writer, Franz Kafka. You can also visit Europe’s oldest synagogue. Visit Prague Castle, the fairytale castle that’s loomed over Prague for a thousand years. It’s been the home of Holy Roman Emperors and Bohemian Kings. The Gothic Cathedral of St Vitus is part of the castle complex and it took six centuries to build. On Golden Lane you’ll see some of the oldest houses in Europe, dating back to the 16th-century.